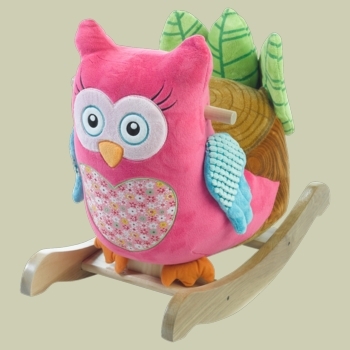 Meet Eleanor Whooo, our brightly colored, rocker who’s more than just adorable. She has features to delight and educate, including: hidden squeakers and songs that enable young riders to learn shapes, numbers, the alphabet, and colors. Four push-activated buttons activate Eleanor’s music. Another terrific feature…The “leaf” on the back of the stump seat is reinforced with a strong hardwood back that is secured to the rocker base, adding support for the rider’s back. You have the option to personalize one of the wood rails, creating an extra-special keepsake Personalization has an 11 character limit and, when selected, one wood rail will be engraved and then painted for a prominent look. Click on More Images above to see color options and additional rocker images. Proudly made in the USA: All wood products, stuffing, production, assembly. Fabric shells and music boxes are from overseas. Approximately 24”L x 12”W x 17”H. Made for ages 9 months and up. Rider weight limit of 80 pounds maximum.